It's been a while since I last baked from Dorie's Cookies with Tuesdays With Dorie bakers. 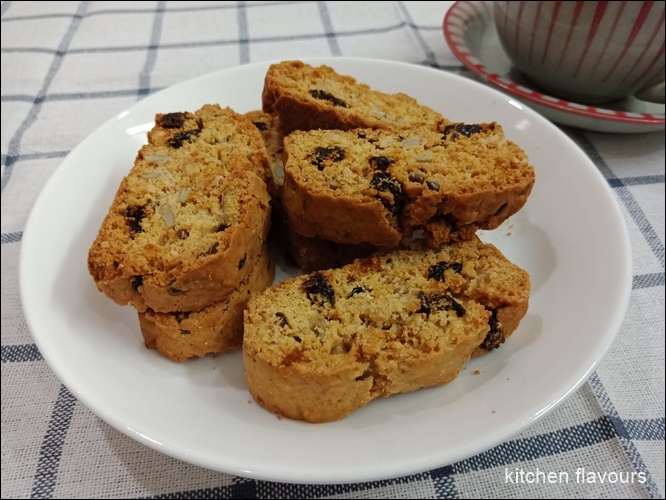 Fruit And Four Grain Biscotti was one of the recipe selected for January. Biscotti is one of my favourite snack to munch on. I like eating it for breakfast, tea-time treat or simply a snack anytime of the day. Looking through the ingredients list, I have all of the ingredients except kasha aka buckwheat groats. I have replaced it with sunflower seeds instead. For the dried fruits, I've used raisins. There's wheat germ, whole wheat flour, rolled oats, and flavours from these spices ; grated nutmeg and ground cloves. I've used ground nutmeg instead of grated. The dough was pretty easy to do, shaped into logs and baked for 25 minutes until lightly browned and firm. Let the dough rest for 20 minutes and then cut into slices. Dorie says to use a serrated knife, but I find that the dough breaks apart in pieces. I switched to a regular straight bladed knife which is very sharp, and it works well, almost all the pieces stay in one piece, some with little cracks, but acceptable. Bake the pieces until golden brown, about 30 minutes more, turning them over halfway into the baking time. These biscotti are very crispy, flavoured with a touch of the spices, love the nutty sunflower seeds and the sweet raisins. An absolute delight to snack on, I love these! Quite addictive! Yum! 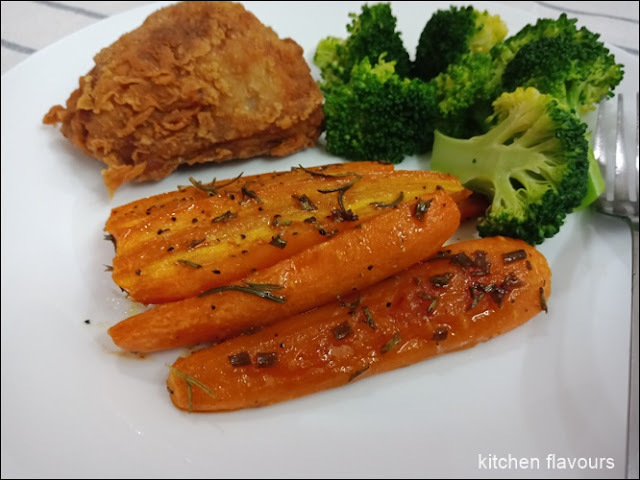 A simple carrot side dish. Makes a delicious side to roasts. Try to get the smaller carrots about the same size. Peel and sliced them in half, coat with the mixture of chopped rosemary, butter, brown sugar, salt and chili powder. Roast in the oven under the carrots are tender, about 30 minutes. Sweet, tender delicious carrots. I served it alongside some fried chicken and broccoli. Parsnips and sweet potatoes can be used instead of the carrots. In a small bowl, beat together the butter, brown sugar, rosemary, salt, and chili powder. 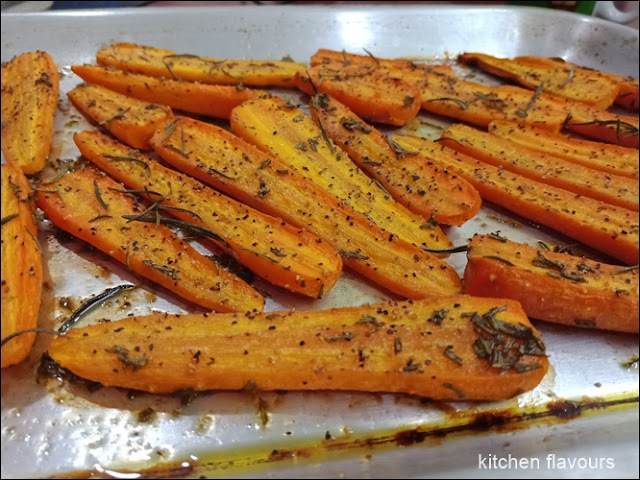 Arrange the carrots in a single layer on a baking sheet. Using your hands, spread the butter mixture all over the carrots. Roast the carrots, turning once about halfway through, until fork tender, 25-30 minutes. Serve right away. Potato Burger Buns, variation from the main recipe Potato Dinner Rolls from Bread Illustrated. Uses a cup of mashed Russet potatoes, with some of the potato water from boiling the potatoes. 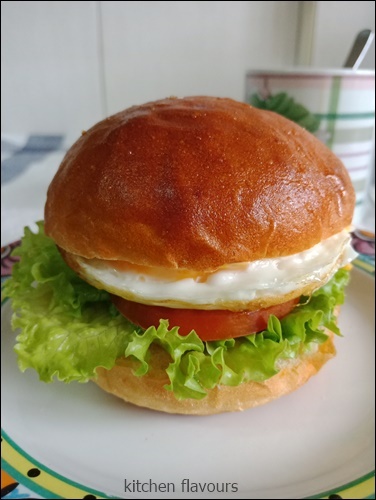 I top a few of the buns with a sprinkling of sesame seeds and the rest without.The buns baked to a deep golden brown, thanks to the egg wash. 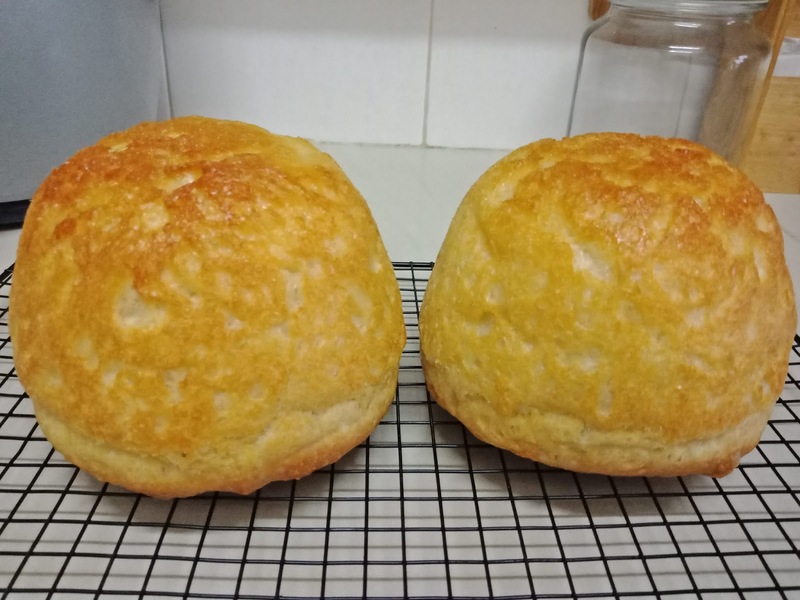 The baked buns are soft but not fluffy soft as I thought they would be. Use the burger buns to make Egg Banjo, for our lunch. Place potato in medium saucepan and cover with 1 inch cold water. 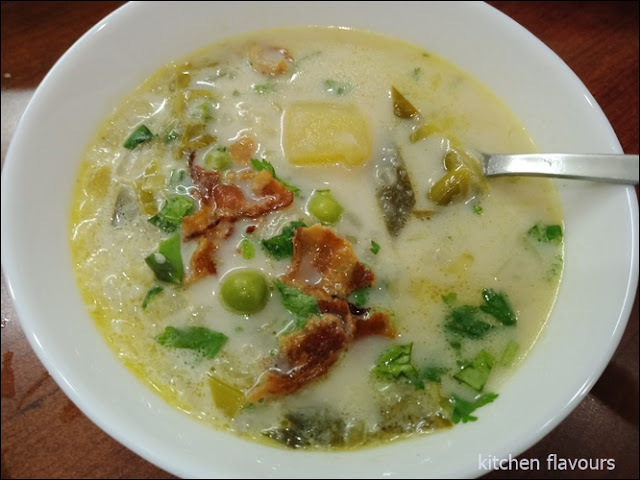 Bring to boil over high heat, then reduce to simmer and cook until potatoes is just tender (paring knife can be slipped in and out of potato with little resistance), 8 to 10 minutes. Transfer 5 tablespoons (2-1/2 ounces) potato cooking water to 4-cup liquid measuring cup and let cool completely ; drain potatoes. Return potatoes to now-empty saucepan and place over low heat. Cook, shaking saucepan occasionally, until any surface moisture has evaporated, about 30 seconds. Off heat, process potatoes through ricer or food mill or mash well with potato masher. Measure 1 cup very firmly packed potatoes (8 ounces) and transfer to separate bowl. Stir in butter until melted and let mixture cool completely before using. Discard remaining mashed potatoes or save for another use. Whisk flour, yeast, and salt together in bowl of stand mixer. Whisk egg and sugar into potato cooking water until sugar has dissolved. Add mashed potato mixture to flour mixture and mix with your hands until combined (some large lumps are OK). 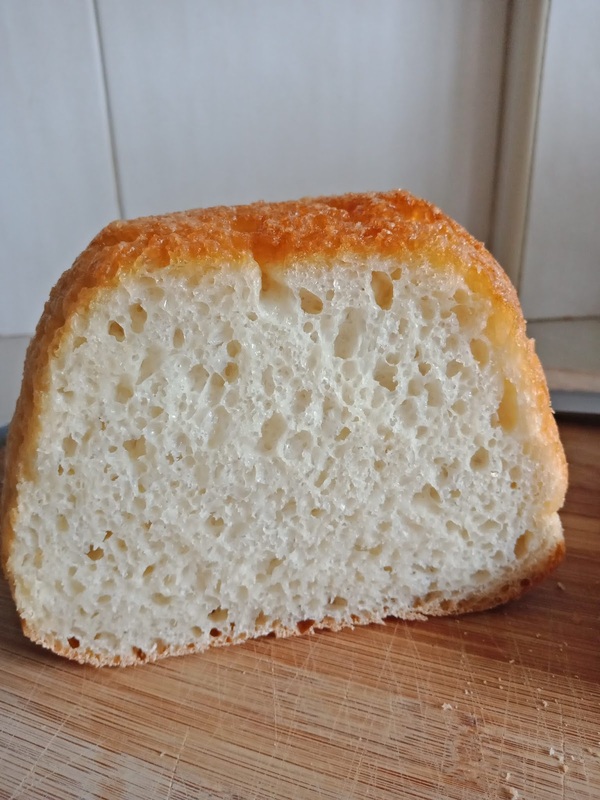 Using dough hook on low speed, slowly add cooking water mixture and mix until cohesive dough starts to form and no dry flour remains, about 2 minutes, scraping down bowl as needed. Increase speed to medium-low and knead until dough is smooth and elastic and clears sides of bowl but sticks to bottom, about 8 minutes. Line rimmed baking sheet with parchment paper. Press down on dough to deflate. Transfer dough to clean counter and stretch into even 12-inch log. Cut log into 12 equal piees (about 2 ounces each) and cover loosely with greased plastic. Working with 1 piece of dough at a time (keep remaining pieces covered), form into rough ball by stretching dough around your thumbs and pinching edges together so that top is smooth. 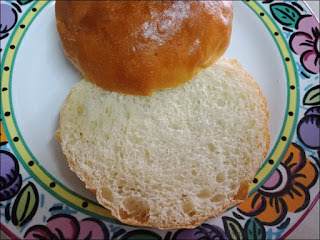 Place ball seam side down on clean counter, and, using your cupped hand, drag in small circles until dough feels taut and round. Arrange dough balls seam side down on prepared sheet, spaced about 1-1/2 inches apart. Cover loosely with greased plastic and let rise until nearly doubled in size and dough springs back minimally when poked gently with your knuckle, 30 minutes to 1 hour. (Unrisen rolls can be refrigerated for at least 8 hours or up to 16 hours ; let rolls sit at room temperature for 1 hour before baking). Adjust oven rack to upper-middle position and heat oven to 425 degrees. Gently brush rolls with egg mixture and bake until golden brown, 12 to 14 minutes, rotating sheet halfway through baking. Transfer rolls to wire rack and let cool for 15 minutes. Serve warm or at room temperature. Divide dough into 9 pieces (about 2-3/4 ounces each) and shape into smooth, taut rounds as directed in step 6. Let rounds rest for 15 minutes, then press into 3-1/2 inch disks of even thickness. Arrange disks on 2 parchment paper-line rimmed baking sheets and let rise as directed in step 7. 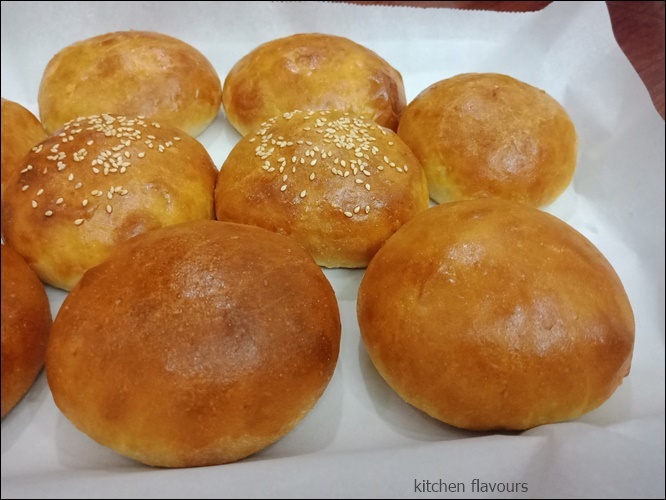 Sprinkle rolls with 1 tablespoon sesame seeds, if desired, and bake on upper-middle and middle racks until rolls are deep golden brown, 15 to 18 minutes, switching, and rotating sheets halfway through baking. Makes 9 burger buns.